COMING SOON: Cooking classes and Folklore dancing. 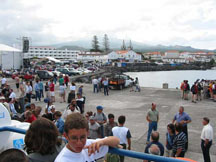 Learn to Speak Portuguese in the Azores with Maria Oliveira! A three-week Portuguese Language Immersion Program is planned for July 1 to 20, 2019. Students will attend private Portuguese language lessons up to 16 hours. Afternoons and weekends are reserved for sightseeing, tours of the Island of São Jorge, visits to Pico, and Faial, and much more. Students will be able to practice their newly learned skills with local tour guides and residents, most of whom are native Portuguese speakers. Classes instructed by Maria Oliveira and other credentialed native speakers. PLEASE NOTE: This immersion program is for adults aged 21 and older only. 20 days in the Azores for just €2.220,00 euros (double occupancy) and €2.690,00 euros (single occupancy). Our price is in Euros. Click here to find out why. A deposit of €350,00 euros (or its equivalent in USD) is required at the time of booking, with the total balance due 55 days prior to departure. Of the €350,00 deposit, €200,00 is non-refundable for cancellations made two weeks prior to departure. Maria Oliveira Language Consulting Service reserves the right to change dates or to cancel the trip if there are fewer than 6 participants. you to study Portuguese here. Payment for the Portuguese Language Immersion Program is now based on euros because expenses must be paid in the local currency. Payment may be made by check or wire transfers.